(1968 'Blue Horizon') Pure Pleasure Audiophile re-mastering. 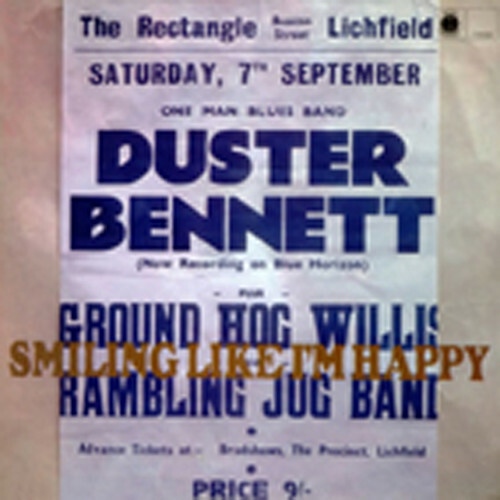 Duster Bennett was a British blues singer and musician. Based in London, he began working as a session harmonica player and member of John Mayall's Bluesbreakers. On his first album Smiling Like I'm Happy he played as a one-man band, he played the bass drum with his foot and at the same time blew the harmonica on a rack, while he played a Les Paul Goldtop guitar donated by Peter Green in 1952. Duster Bennett's music was country blues with occasional gospel music. He recorded three albums and a series of singles for Blues Horizon. He remained popular in the local blues club scene until his death in a car accident in March 1976. Customer evaluation for "Smiling Like I'm Happy"